You love being in the kitchen, the smell of your next culinary masterpiece sizzling in the pan, enjoying the thrill of creating something delicious out of seemingly nowhere. Maybe you use a long-held family recipe—or not. Maybe you keep your space clean like your mother told you to—but then again, maybe not. Maybe you use butter, or oil, or even a deep fryer (after all, that’s what your grandmother always taught you during your visits to her kitchen.) But for sure, you just enjoy the way that food makes people feel something. Love it or hate it, to provide comfort or simply to nourish, food serves many functions in life. Sometimes, those functions aren’t necessarily the most positive way that food affects the people we love. Unless you’ve been living in your pantry, you know that obesity and the need for nutritious eating are in the news daily. One of the greatest misconceptions is that healthy cooking is too hard for the average person, that it’s complicated and out of reach. Whether we’re talking about herbs, spices, fruits, or vegetables, fresh is always better. Nothing compares to the burst of flavor you get from hand-picked, freshly washed, out-of-the-garden ingredients. The aim, of course, is always to celebrate those different tastes and marry them into a healthy, delicious dish. The goal here is, of course, to encourage you to recognize the value of a meal with fresh and light components. And keep in mind that pre-packaged foods typically have added things like preservatives and sodium and really just lose the flavor they claim to preserve. Remember: fresher is better (and yes, this refers to meats as well!). Just like people, you can’t make a decision about a product at first glance. For this reason, it’s important that you don’t judge a food simply by a quick glance at the label; read the ingredients, check the nutrition information, and know what it is you are putting in your mouth. Have you checked the fat content? The calorie count? The amount of sugar? All of these aspects not only affect the taste of your dish but can either improve or adversely affect your health (such as your blood pressure or blood sugar). Use caution and ask your doctor what is best for your health. There is no easy way to say it: put the ketchup bottle down and slowly back away! Classes that focus on health will surely instruct you that many of your favorite condiments are filled with sugars and therefore not going to help you in your quest to learn how to cook healthy. Use condiments and sauces sparingly (remember that homemade is usually healthier) and let the flavors of your food speak for itself. Every good cooking class, whether focused on healthy eating or not, will typically either introduce or strengthen techniques needed to accomplish a better level of culinary skills. 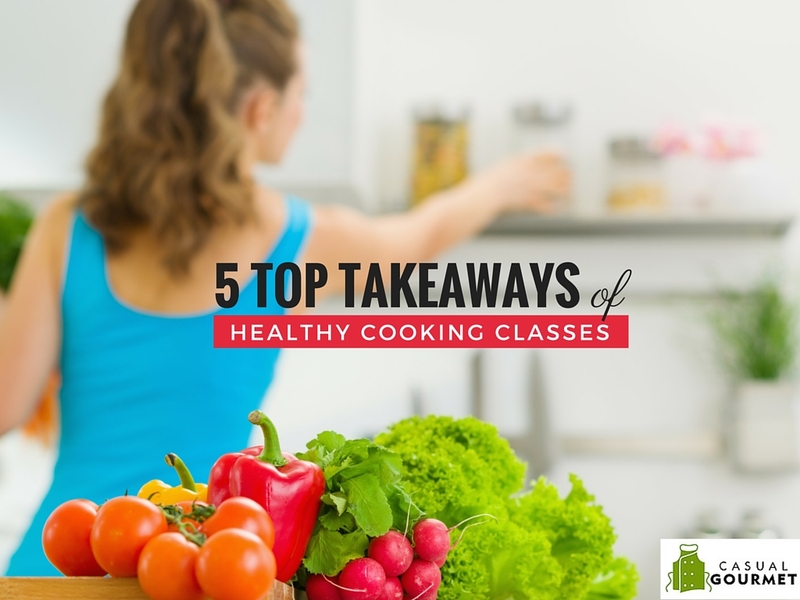 When considering the takeaways from a healthy cooking class, it’s critical to watch for ways that you can come away a stronger cook overall. Measurement precision, proper seasoning, and yes, possibly even getting as basic as how to boil water—challenge yourself to grow beyond what you knew before you signed up for the class. It may seem easier to pile food on your plate and mindlessly eat without thinking about the consequences of what is there. But the truth is, the junk food you eat can only cause more harm than good, both in the short term (when your tummy aches from too much fat and sugar) as well as the long term (when your body starts to experience debilitating illnesses from being neglected). If you take a healthy cooking class, it is reasonable to expect to learn the value of having quality (i.e. fresh, portioned foods that are cooked smartly) over quantity. When you make the decision to learn how to cook in a healthier style, you may feel as though you’re moving from the frying pan into the fire. In fact, the argument can be made that your positive choices will potentially help you break free from the confines of unhealthy food choices. If you want to learn more about cooking healthfully, contact the Casual Gourmet, cooking courses for the at-home cook through the Culinary Institute of Virginia.